Welcome, October! It's the start of a new month and a new beginning---another chance to play catch-up on this poor, neglected blog, lol. It's been a crazy few days with my son having surgery AND a birthday party in the same week, plus all sorts of other stuff, like t-ball, swim lessons, etc. I promise that I will be cranking out Day 2 and Day 3 of the Mothman Festival blogs soon, but I thought I'd go ahead and share this creepy photo I found floating around on Facebook! Whenever this frightening lady makes an appearance on social media, she's usually accompanied by the caption of "Madam Violet, the queen of the notoriously dark Edinburgh vampire hive. Voted twice as the scariest woman in England." ...a piece of art! As part of the 2008 series, Storydress II, this unique image was created by Christine Elfman. 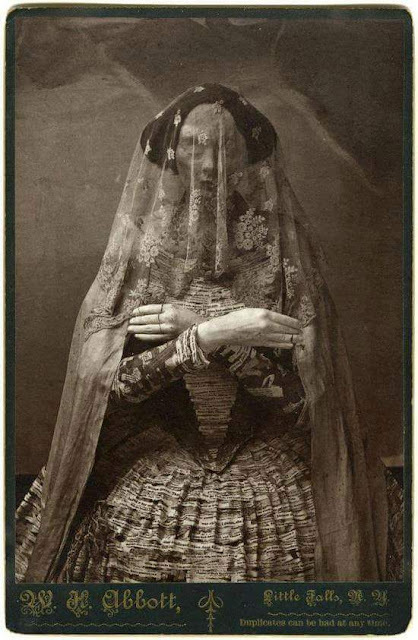 The photos in the series, including this one of 'Madam Violet,' are albumen prints pasted to antique cabinet cards for a very realistic touch. But who is 'Madam Violet,'??? In this case, Madam Violet is none other than a paper mache and plaster sculpture! For more info on this photograph and how it was made, please see Christine Elfman's WEBSITE.